Also serving communities of Chicopee, Leeds. There are 15 Assisted Living Facilities in the Springfield area, with 2 in Springfield and 13 nearby. The average cost of assisted living in Springfield is $3,225 per month. This is lower than the national median of $3,346. Cheaper nearby regions include West Springfield with an average starting cost of $3,000. To help you with your search, browse the 92 reviews below for assisted living facilities in Springfield. On average, consumers rate assisted living in Springfield 4.5 out of 5 stars. Better rated regions include Agawam with an average rating of 4.8 out of 5 stars. Tagged as the City of Firsts, Springfield boasts of a rich history of innovations and has grown through the years to become the third largest city in Massachusetts. Twelve percent of its population comprises the 65 and above group. Residents within this group can find help with activities of daily living from among the 15 assisted living facilities within the area — two of which are located right within the city. Known in the state as Assisted Living Residences, these facilities are certified by the Department of Elder Affairs. The Springfield area is home to world-class medical facilities, including the Mercy Medical Center and the Baystate Medical Center, in the event of medical emergencies or illness. The Pioneer Valley Transit Authority operates transit services in Springfield and other member communities in Massachusetts. Senior patrons can purchase a Senior ID Card to enjoy reduced fares. The PVTA also offers on-demand van services for residents 60 years and above. Springfield has an array of community resources for seniors, including Elder Affairs programs, administered by the city’s Council on Aging under the Department of Elder Affairs. These programs are aimed towards enhancing seniors’ quality of life. The downtown area of Springfield is home to five world-class museums, offering seniors leisurely art and cultural activities. Senior visitors are entitled to admission discounts while residents with valid IDs can visit free-of-charge. Music-loving seniors can also avail of discounted tickets for select seating areas at Springfield Symphony Orchestra concerts. Massachusetts offers some form of tax relief for seniors in Springfield and the rest of the state. While the state grants full tax exemptions for Social Security retirement benefits and public pension income, it deducts full-rate income taxes on retirement account withdrawals and private pension. Springfield has an overall cost of living index of 95, significantly lower than the state’s 139. This makes it one of the more affordable locations within Massachusetts. Healthcare cost is listed at 84, providing seniors reasonable savings on medical expenses. Assisted Living costs in Springfield start around $3,225 per month on average, while the nationwide average cost of assisted living is $4,000 per month, according to the latest figures from Genworth’s Cost of Care Survey. 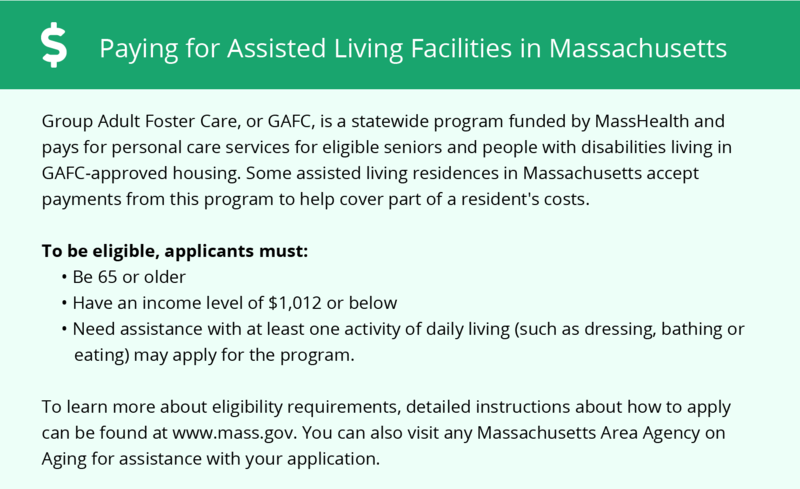 Eligible seniors in the Springfield area can apply for state-funded financial assistance to help pay for assisted living costs. 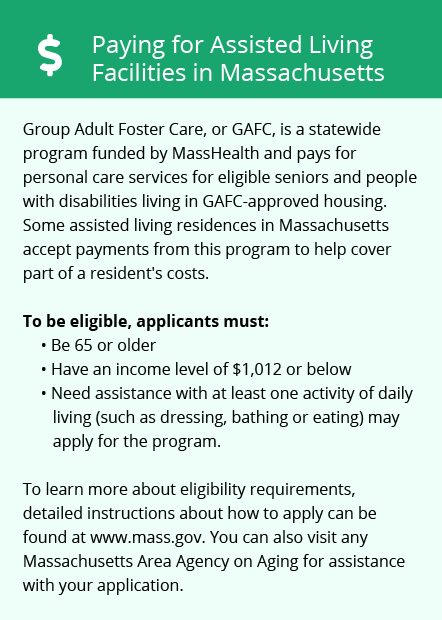 Two government programs are offered: Group Adult Foster Care and Supplemental Security Income Category G.
To see a list of free assisted living resources in Springfield, please visit our Assisted Living in Massachusetts page. Springfield-area assisted living communities must adhere to the comprehensive set of state laws and regulations that all assisted living communities in Massachusetts are required to follow. Visit our Assisted Living in Massachusetts page for more information about these laws.